Garnet as named Connecticut's State Mineral in 1977 by the General Assembly. Connecticut is one of the finest sources in the world of the almandine garnet. An ancient gem, it was named "garnata" in the 13th century by Albertus Magnus, and was known as the "Carbuncle," likening it to a small, red hot coal. The garnets are actually a group of similar minerals, complex silicates of the same atomic structure, but differing in chemical composition. They vary in color from pale to dark tints, including the deep violet-red of the almandine garnet. This mineral's hardness, 7 on the Mohs scale, has made the garnet useful as an abrasive, resulting in an important industry throughout Connecticut's history. It contributed to this development by providing the base for grinding wheels, saws, and the better cutting quality of garnet paper, a variety of sandpaper. In 1977, the Connecticut General Assembly designated the mineral garnet, variety almandine, as the state mineral. The garnet "group"of minerals is well known from many localities around the state. Both ornamental and functional, garnet is readily identified by its small granular crystals, most often seen in a deep reddish brown color. A very common constituent of our rocks, garnets of several colors and varieties are found in many localities around Connecticut. Some of these include Roxbury, Redding and Colchester. Garnets are a common constituent of the igneous rock pegmatite, and of coarse granite and granite gneiss. Garnets are also frequently found in mica schist, a common metamorphic rock. 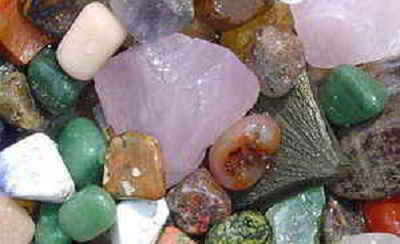 One can also find tiny garnets in beach sand and in sandstone deposits. Color can range from colorless through red, cinnamon and yellow, to green, brown and black. The most commonly found garnets in Connecticut are red, reddish brown, with darker colors to black. 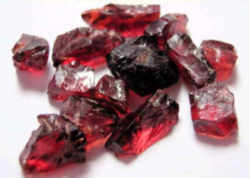 Garnets are called a "group"because similar minerals of different chemical composition have the same atomic structure. 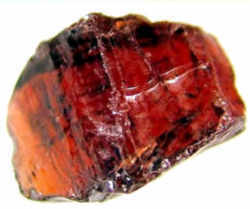 The variety almandine is an iron aluminum garnet. Other varieties found in the state include pyrope, magnesium aluminum; grossular, calcium aluminum; spessartine, manganese aluminum, and andradite, calcium iron. Transparent garnets of good color can be cut as gemstones, but it is rare to find garnets of that quality in Connecticut. Most commonly, rough garnet is used as an abrasive, as in sandpaper and emory boards. All species of garnets possess similar physical properties and crystal forms, but differ in chemical composition. The different species are pyrope, almandine, spessartine, grossular (varieties of which are hessonite or cinnamon-stone and tsavorite), uvarovite and andradite. The garnets make up two solid solution series: pyrope-almandine-spessarite and uvarovite-grossular-andradite. Almandine garnet is an iron aluminum silicate with a characteristic red color. Other distinguishing properties: Forms in 12x-sided equant balls. 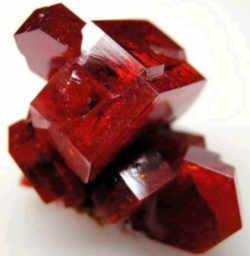 Commonly found in metamorphic rocks, such as garnet shists. Garnets are commonly used as abrasives and in sand paper, because of their hardness. 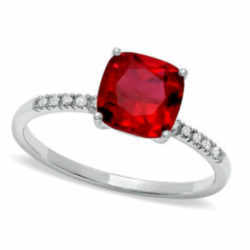 Garnet is the birthstone for January, and is also the accepted anniversary gemstone for the 2nd year of marriage. The gemstone's resemblance to pomegranate seeds earned its name, from the Latin word for the crimson fruit, granatum. Its deep red color symbolizes passionate devotion, friendship, vitality, and balance. Garnet, derived from the word granatum, means seed, and is called so because of the gemstone's resemblance to a pomegranate seed. The gemstone dates back to 3100 BC, when the Egyptians used garnets as inlays jewelry. Legend holds that Noah hung a large garnet in the ark for illumination. It reportedly also gives its wearer guidance in the night, protection from nightmares, and according to Egyptians, is an antidote for snakebites and food poisoning. Garnets are durable and brilliant and the most popular color of a garnet is reddish-brown, it comes in other colors such as purple, pink, violet, green, yellow, orange, red, brown, black, and even colorless. 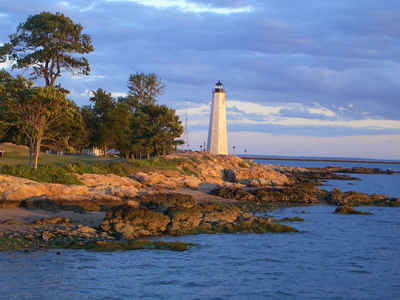 The law designating garnet as the official Connecticut state mineral is found in the Connecticut General Statutes, Title 3, Chapter 33, Section 3-110b. Sec. 3-110b. 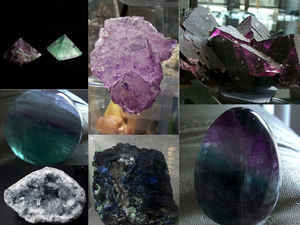 State mineral. The garnet shall be the state mineral.